Ruby Rose looks sensational in her Batwoman costume, as the DC Comics superheroine prepares to make the leap from page to screen. The newest character in the CW's Arrowverse hasn't quite touched down just yet, but the network has gone ahead and released a first official look at how the character will appear when she makes her debut in an upcoming crossover event. To sum it up, she looks fierce, comics-accurate, and perfectly-coiffed. The cape looks nice, too. And all this just in time for Halloween. Rose was cast as Batwoman in August, around a month after reports first emerged that the CW was developing a live-action Batwoman series. The new show will compliment the other DC Comics superhero series on the network — a lineup which currently includes Arrow, The Flash, Legends of Tomorrow, Supergirl, and Black Lightning. Unlike Black Lightning, which has so far largely stood on its own in the CW's superhero slate, Batwoman will associate itself with the other heroes of the Arrowverse right from the jump. Prior to heading up her own series, the Batwoman character will make her first appearance in the three-part Arrowverse crossover event "Elseworlds", which is set to begin on Sunday, December 9 with an episode of The Flash. The event will continue in an episode of Arrow on Monday, December 10 and conclude with an episode of Supergirl on Tuesday, December 11. The Batwoman series proper will then follow sometime in 2019. While details on the story of the "Elseworlds" crossover are somewhat scarce, the title alone seems to imply that the Arrowverse will once again be indulging in some alternate universe shenanigans, as it has to great effect in past crossover episodes like "Crisis On Earth-X". DC has also announced that the team-up event will introduce comics character The Monitor, a nearly-omnipotent, Multiverse-hopping entity played by Designated Survivor's LaMonica Garrett. According to the CW, the crossover will follow the established Arrowverse heroes (minus the Legends of Tomorrow) as they travel to Gotham City, presumably on some sort of crime-fighting adventure. The question is, which Gotham City will they be going to? We know from Arrow and Supergirl that a Gotham City exists on those two characters' Earths, so will this be the Gotham of Earth-One, Earth-Thirty-Eight, or another Earth we haven't visited before? We're not sure — but these are exactly the kinds of questions that make following this meta-series so fun. The particular version of Batwoman that Rose will be playing is Kate Kane, who has been presented in the comics as a wealthy heiress in the Gotham City social scene. While we haven't seen her in action yet, reports say that the character will be portrayed as an out-and-proud lesbian and capable street fighter who is at first reluctant to don the cape, the cowl, and the big red wig. Aren't they always, though? You can't take up a Bat-mantle without at least a little inner turmoil. Rose's casting prompted backlash from some online commentators, with criticisms of Rose's gender identity, sexual orientation, race, and religion reportedly driving her off of Twitter, because that's apparently just what happens now when you get cast in something popular. Hopefully, this look at Rose in costume will help to drive away any remaining detractors, or at least distract them with something else to complain about. To our eye, it's hard to imagine how you could get any closer to a live-action version of the comic book look than this. Specifically, the design of the costume for the TV series seems to be taking inspiration from the version of the getup popularized by the DC Comics series 52. 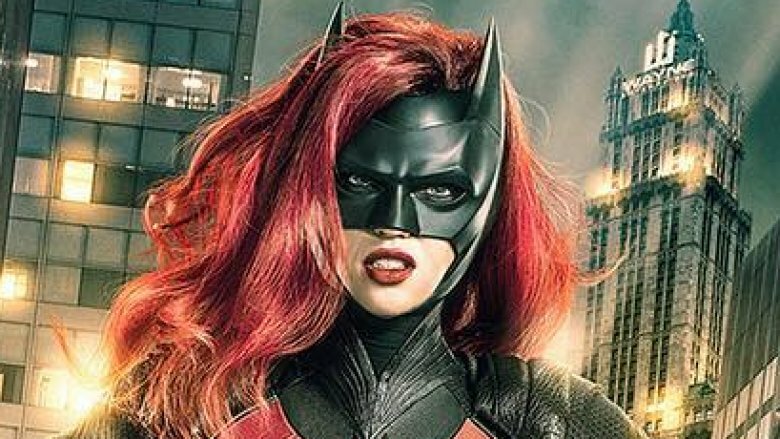 Obviously, the most distinguishing feature here is the voluminous shock of red hair cascading out the back of the Batwoman cowl, which could be mesmerizing to see in motion if it's done well. It's already a better red wig than the one Marvel slapped on Medusa for the much-maligned Inhumans show. And now that we mention it, it's also a lot better than the one Sony used for that post-credits scene in the Venom movie — you know, the one we probably shouldn't spoil here. The one thing this costume snapshot doesn't address is where Batwoman intends to carry all her stuff. That's a pretty slim utility belt, after all; Maybe the cape has pockets. Or maybe they'll outfit Batwoman with her classic, 1950-era Bat-Purse accessory, for those nights when she needs to carry around a change of shoes along with the baton and Batarangs. These are the kinds of things you have to think about when you're a fashion-forward crime fighter — Batman and Robin have it easy.